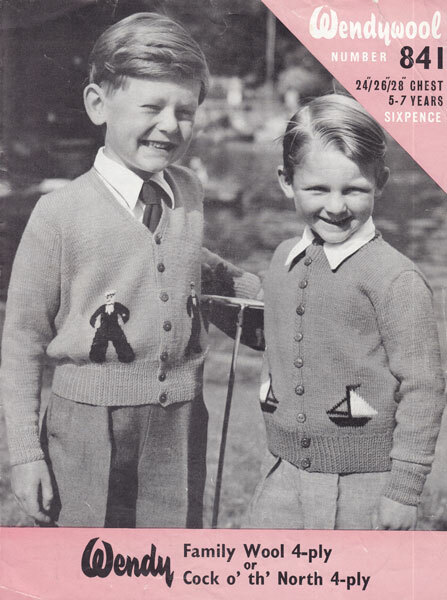 Robin 264: Great vintage child's jumper knitting pattern with one for picture knit from the early 1950s. This one has instructions for plain raglan round neck jumper and also for working a rather fun dancing rabbit border, a chart is provided. To fit 22, 24 and 26 inch chest in a vintage quick knitting wool that knitted similar to a double knitting. Always a tension square. Robin 1250: Great vintage knitting pattern for girl's suit with intarsia Scottie Dogs in double knittng - I made lots of these types of sets for both my girls as they grew up in the 1960s they were so useful and smart. This one is to fit 20-26 inch chest. There are instructions for jumper, cardigan and skirt. Look very sweet on toddlers. Robin 1125: Vintage knitting pattern for intarsia footballer jumper with polo neck. this jumper is worked in a chunky yarn, so work a tension square in the yarn you choose to see if you need to change needles. This one is worked on imperial 2 and 5 (7mm and 5.5mm) plus set of 4 double ended 6 (5mm) for polo collar, or make as round neck, working neck before joining final shoulder seam. To fit 28", 30", 32" chest. Sirdar 94: Great little vintage knitting pattern for V neck cardigans with intarsia or pictures with rabbits dancing round, flowers for a flower child or trendy Fair Isle, knitted in vintage 3ply, try tension square to see if 4ply might work better - to fit 22" the Rabbits, 23" the Fair Isle border and 24" for the flower border. Sirdar 203: Great vintage romper set knitting pattern with teddy motif from 1960s. This lovely pattern has instructions for cardigan, jumper and pants with teddy motif. To fit 6-12 months or 20 inch chest. Jumper has zip at back. Knitted in vintage 4ply which seems to knit well to modern 4ply, always work a tension square. Sirdar 244: Great vintage knitting pattern for babies cardigans with motifs. This lovely pattern has little scottie dogs on one and a car with a caravan and pick up truck and traffic lights for a boy or you can knit it plain or just one of the motifs. Worked in double knitting. To fit 2-3 years 22 -23 inch chest. Sirdar 257:Great vintage cardigan knitting pattern for child with poodle motif from 1960s. This picture knit pattern has instructions for a round neck button through, a V neck and a V neck cross over all raglan sleeves and worked in double knitting wool. To fit 2nd 4 years or 22 and 24 inch chest. Small chart provided. 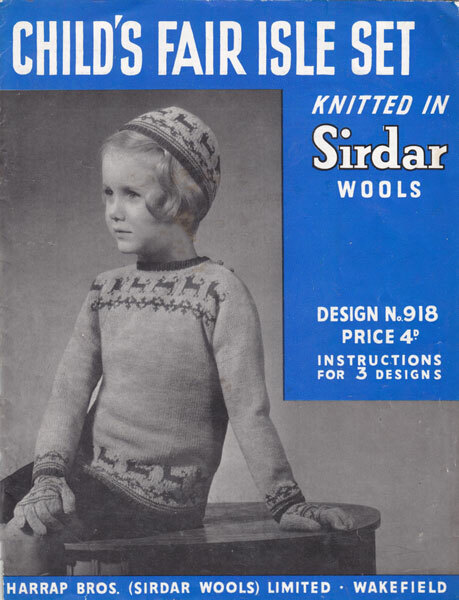 Sirdar 918: Great vintage knitting pattern for a girl's jumper, cap and gloves set in fair isle 1940s. This is a lovely set with dog design knitted in vintage 3ply, so try modern 4ply in a tension square and change needles if needed. To fit 25 inch chest, cap 17 inches unstretched. Colours suggested natural basic with maroon and green, classic 1940s colours. No chart only written instructions. Spider Wools183: Fabulous vintage knitting pattern from late 1930-early 1940s for girl's beret, jumper and glove set with scotties dogs on, intructions for pleated skirt also included. To fit 24 inch chest. (5-7 years.) Colours used in model navy blue ground, grey, blue, red, white, green, yellow. It is knitted in vintage 3ply so try modern 4ply as this knits to a similar tension, always work a tension square and change needles if needed. Spider 192: Great vintage girl's beret cardigan and jumper set 1940s. I love this pattern! Sweet little pandas on the beret, gloves, cardigan pockets and the front of the jumper. Knitted in vintage 3ply so try modern 4ply and change needles if needed. To fit 5-7 years old. suggested colours basic blue and white, black and red. It suggests to use the white wool double to give the pandas a raised effect. Super period pattern. Spider wools 196: Great vintage knitting pattern for girls jumper, beret and gloves set from 1940s, this one has little pixies on, to fit 28 inches chest. Vintage 3ply used, so try modern 4ply in a tension square. Colours used on the model navy, grey,, blue, yellow,red, white. Target 1115: Lovely little boys jumper set fair isle knitting pattern from early 1950s. There are instructions for the little shorts and a smart jumper with terrier type dogs around the bottom. There are also instructions for knitted romper in two colours. Suit to fit 2 years old or 21-22 inch chest and is knitted in modern 4ply. The romper is knitted in 4ply also and is to fit 12-18 months or 20 inch chest. Till 56: Great vintage knitting pattern for jumper sets with teddy bears on 1930s. This is s super pattern and easy to follow, the button neck jumper has little collar and teddys round the bottom, the mittens have a teddy on the back part and the beret has them running round the edge. There are also instuctions for the sweet little pleated skirt and boys shorts. This is so retro, My mother said that all little girls and boys wor this type of thing in the 30s and in the 40s. Knitted in modern 4ply, work a tension square and change needles if needed. Not charted. 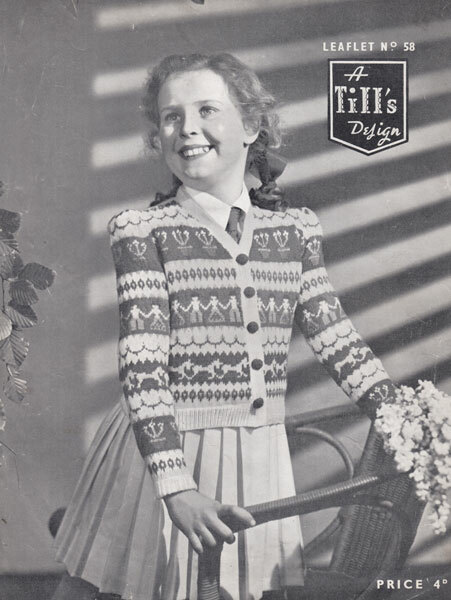 Tills 58: Great vintage child's fair isle knitting pattern for girls cardigan 1940s. This one has a beautiful design featuring flowers, horses and Hanzel and Gretel. To fit 26-28 inch chest and is worked in vintage 3ply, so try modern 4ply in a tension square. Charts for all the picture designs. Colour suggested are main as white, scarlet, darkblue, green, light blue, yellow. Viyella 2023: Great vintage knitting pattern for girl's cardigan with horse and rider motif 1950s. This little cardigan is to fit 24 inch chest. and has a high V neck and is knitted in modern 4ply. Always work a tension square. Weldons 624: Great vintage child's cardigan with reindeer motifs fair isle from 1940s. This little cardigan has contrast bands and reindeers. Would look super knitted in white with red contrast for Christmas. To fit 2-4 years or 24 inch chest. Knitted in vintage 3ply, try modern 4ply and change needles if needed to get tension. There are a couple of little charts for the reindeer. Weldons 725: Great child's jumper with Scottie dogs fair isle knitting pattern from 1940s. This little jumper has a round neck and lots of little dogs all over it! They look like Sealyham Terriers but could be Scotties or Westies. To fit 3-5 years or 24-25 inch chest. With a little chart as well. Knitted in vintage 3ply that should be similar to modern 4ply, check tension. Weldons A785: Beautiful vintage girl's jumper knitting pattern with sampler motifs fair isle from 1940s. So pretty, can be knitted without the border To fit 4-6 years or 25.5 inch chest. Fastened at the back of neck with buttons and loops. Knitted in vintage 3ply that should be similar to modern 4ply now, so work a tension square. Charted. Weldons A867: Another fabulous fair isle pattern in this range. Vintage knitting pattern for boys and girl's Western jumpers with motif of Indian and tipi and cowboy and horse. Shoulder buttons. Knitted in vintage 3ply which was similar to modern 4ply, work a tension square. There are also instructions for long or short sleeves. To fit 2-4 years or 24 inch chest. Weldons 876: Great vintage child's picture knit jumper and cardigan with car and aeroplane from the 1940s. This design has instructions for both the high V neck cardigan with the cars and the short sleeved jumper with the planes. To fit 2-4 years or 24 inch chest. There is a chart for the Planes but not for the cars their instructions are wrtten in the pattern. Jumper fastens at the shoulder with little buttons. Lovely fair isle set. 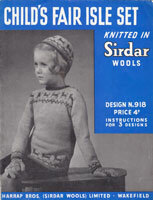 Weldons A880: Great vintage fair isle knitting pattern for jumpers for children from early 1950s. There are instructions for three different designs of round neck, long sleeved jumper with set in sleeves. the motifs are deers, chicks and elephants. To fit 2, 4 and 6 years or 23, 24-25 and 26 inch chest. Charted. Knitted in modern 4ply. Always work a tension square. Weldons A891: Fabulous vintage fair isle or intarsia knitting pattern for little set for boy or girl. Early 1950s. This one has the hare and the tortoise motifs. Knitted in vintage 3ply, so try tension square in modern 4ply or for smaller size knit in modern 3ply or larger try double knitting and size 10 needles. There are instructions for a raglan cardigan, short sleeve jumper and slip over. If you use double knitting to get a larger size remember that more wool will be needed. Weldons B960: Great vintage fair isle or intarsia knitting pattern for boys sweater from the early 1950's. Knitted in vintage 3ply, so try modern 4ply, try a tension square. To fit 2-4 years or 23" chest. Use double knitting for larger size as above, but allow more yarn if you do this. This one has sailors and boats - great for a son of the Navy. Weldons B976: Great vintage little girls twinset with flowers in fair isle knitting pattern from 1950s. To fit 5-7 years or 24-26 inch chest. Knitted in vintage 3ply, so try a tension square in modern 4ply. The little jumper has the flowers in a band across yoke, and has short sleeves - it is button with 4 tiny buttons at the shoulder. No fair isle chart. Weldons B988: Great vintage knitting pattern girls twin set with fair isle 1950s. This little set has motifs from the sea side including a sail boat, sand castle and bucket and spade. Worked in vintage 3ply, so try a tension square in modern 4ply. To fit 3-5 years or 23-24 inch chest. Weldons B989: Lovely vintage girl's flower bordered cardigan in fair isle from 1950s. This pretty duo are dressed a twin set that evokes the very special feminine styles of the decade, even for children. The jumper has contrast buttons at shoulder and the rib makes for a nice fit. Not charted. Worked in vintage 3ply so try modern 4ply and change needle size if needed. Weldons B1043: GREAT PATTERN FOR JUBILEE YEAR! Fabulous vintage fair isle or intarsia knitting pattern for 2-4 years and 4-6 years, 22"-23" chest. A v neck or round neck cardigan instructions for both styles and both the Soldiers of the Queen design and the Union Jack design. Knitted in vintage 3ply so try modern 4ply in a tension square. Weldons A1059: Great vintage child's jumper and cardigan with Muffin The Mule 1950s. Share your shildhood with your grandchild with this super little twinset. Who didn't love old Muffin and his clicky hooves!! Annette Mills!! Do you remeber the springy dog? These are knitted in vintage 3ply so try modern 4ply and always work a tension square. There are lovely charts for this. To fit 2-4 and 4-6 years or 23-34 inch chest. Weldons B1119: Great vintage knitting pattern with intarsia planes and cars, for young lad, or a little girl, in two sizes for ages 2-6, chest size22.5"- 23.5" knitted in vintage 3ply so try modern 4ply in a tension square to see if you need to change needles, if you use double knitting to get a bigger size, remember to change needle size and to allow for more wool, about as half as much again. Weldons B1127: Great vintage girl's twinset knitting pattern with circus motifs from the 1950s. This super pattern has instructions for the little short sleeved jumper and V neck cardigan to fit 2-6 years in two sizes (2-4 and 4-6 years) 22 to 23 and 24-25 inch chest. There are charts to help with working the fair isle. the motifs are seal with ball, horse and rider, lion and elephant and the clown. These motifs can always be used for other things as well. Worked in vintage 3ply, so try modern 4ply. Always work a tension square. Weldons B1141: Great vintage fair isle knitting pattern for jumpers for children from later 1950s. There are instructions for three different designs of round neck, long sleeved jumper with set in sleeves. the motifs are deers, chicks and elephants. To fit 2, 4 and 6 years or 23, 24-25 and 26 inch chest. Charted. Knitted in modern 4ply. Press studs at shoulder to close. Always work a tension square. SAME PATTERN AS A880 above, produced a bit later in the decade. Weldons B1154: Great vintage little girl's or boys twin set with fair isle motifs from 1950s. There are motifs of 4 leaf clover, lucky horseshoe, black cat and no 3. Jumper has long or short sleeves, with buttons at shoulders. Knitted in a vintage 3ply that will probably be similar to a modern 3ply, always work a tension square. To fit 2-6 years or 22.5-23.5 inch chest. Would make nice retro wedding outfit! Weldons B1161: Great vintage knitting pattern for boys astronaut jumper 1950s. Instructions for jumper and zip cardigan with collar, just the thing for a trip to the planet Zorg with Flash Gordon! Worked in vintage 3ply, so try modern 4ply in a tension square. To fit 6 -8 years or 26-27.5 inch chest and 8-10 years or 27-29 inch chest. With small chart for space rocket. Weldons B1162: Great vintage child's knitting pattern for Noah's Ark and animals from 1950s. This little set is knitted in vintage 3ply, so try modern 4ply in a tension square and will fit 2 years and 4-6 years (23.5 and 24.5 inch chest) This charming two colour twinset is great for either boy or girls. There are lions, elephants, giraffes, flamingos, kangaroos, ibex and leopard and the ark with Mr and Mrs Noah on the jumper also the ark and Mr and Mrs Noah on the cardigan. Charts included. Great fun!! Weldons A1182: Great vintage babies cardigan fair isle motifs from 1940s. There are instructions for flowers, teddies and cats around the borders and the cardigans have raglan sleeves and V necks for nice fit. Worked in vintage 3ply which should knit to size in modern 4ply with a change of needles if needed. To fit 19-21 inch chest or 6-12 months. Weldons A1199: Great vintage boys V neck jumper with cowboy and bucking bronco motif from 1940s. This fair isle jumper is knitted in vintage 3ply and should fit 4-6 years and 6-8 years or 24.5-25.5 and 26-27 inch chest. Size change made by using larger needles. Charted. Try a tension square with modern 4ply and see if you need to change needles. Weldons 1200:Great vintage boys V neck jumper with Indian head motif from 1940s. This fair isle jumper is knitted in vintage 3ply and should fit 4-6 years and 6-8 years or 24.5-25.5 and 26-27 inch chest. Size change made by using larger needles. Charted. Try a tension square with modern 4ply and see if you need to change needles. Weldons B1437: Super vintage knitting pattern for fair isle motif cardigan with kangaroo from 1950s. How unusual is this? But as my husband knows full well there was a lot of movement of families out to Australia in the 1950s - his family was one of them. This would have been great for any youngster making that long trip and big adventure. To fit 2-4 and 4-6 years or 22 to 23 and 24-25 inch chest. Try modern 4ply in a tension square. Weldons 1555: Great vintage knitting pattern for girls and boys with fair isle motif from 1950s. Big friendly rabbits sit on the super zip cardigan for little ones. To fit 2-4 and 4-6 years or 23-24 and 24-25 inch chest. Knitted in double knitting wool, but work a tension square all the same. woolworthW144: Great vintage knitting pattern from 1950s. This design has three different cardigans, two with V neck and one which is button through. Can be knitted with or without motifs. There is a rabbit or a guardsman. To fit 18, 20, 22 or 24. Charted. Knitted in double knitting.